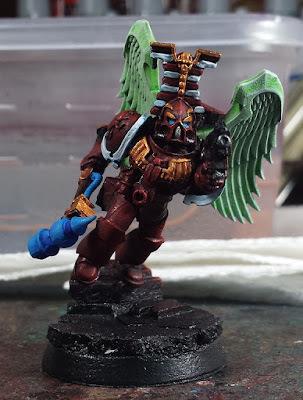 Just a quick hit today, while I was plugging away at all the little details on the assault squad this morning I took a crack at doing some ghostly-looking wings on Sergeant Mekhata. 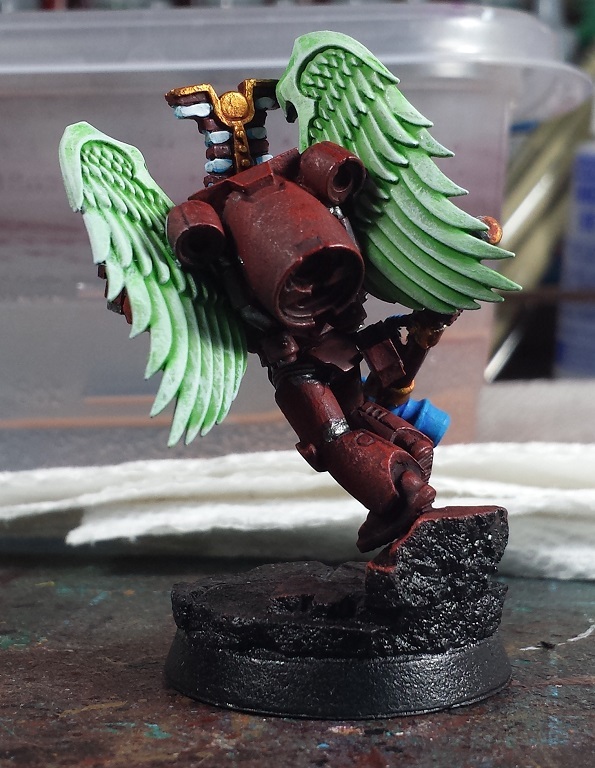 Fairly straightforward process, started off by basecoating the wings in stonewall grey, then built up the highlights with ghost grey and finally skull white. Then they got a going-over with Waywatcher Green glaze. Once that dried, I went back over them with a light drybrush pass of ghost grey again. I'm reasonably pleased with the effect, and think I'll be using that technique again on some planned familiars/tutelaries! See I would have had to start from the green and work it out. I can't imagine doing it the other way. Bravo, works well. Certainly stands out nicely from the deep red. Agree with Zab, a little OSL on the armour would help the glowy effect more. @Rory Priest: Aye, tried a couple test models beforehand and the "washing down from white" ended up looking a little better - the waywatcher green glaze is a little more neon which worked a bit better than the biel-tan green wash which is a very dark tint. @Frothing Muppet: Thanks very much! @Rob Hill: Aye, it's two glowy things on one model which tends to make the eye jump around. Slightly distracting but is less noticable when he's ranked up with the rest of the unit. @Zab: Indeed - some OSL will really make it pop. I'm a bit stumped on how best to accomplish it though, as far as colors - the green tint is from a wash which is essentially the opposite of what ya want for glow. 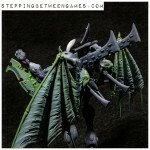 Maybe a light drybrush of a scorpion green or something? OSL is not my forte - more reseach is needed! @Dai: I appreciate it! Some OSL would sell it as a spectral glowy sort of thing. Thanks for the kind words and suggestions folks! @Zab: Sounds like a plan - I'll give it a shot! Cheers!